Last time we looked at Darth Maul and the theme nemesis in The Phantom Menace. He was placed narratively as Obi-Wan Kenobi’s opposite, and this was shown visually through his costume. When he made his return on The Clone Wars he had lost many things – his sanity, his lower body, his grasp of basic dress etiquette, his place in power by his master’s side. But he had not lost one thing: his nemesis, Obi-Wan Kenobi, and need for revenge. This week: Maul in The Clone Wars and Rebels. Now, when joking about Maul and his disassociation with clothing after his resurrection, people tend to bring up the limitations of animation. Stylistic choices have to be made as animating fabric takes time, and time means money. See Darth Vader’s Amazing Budget Eating Cloak in Rebels. So lines and silhouettes are trimmed down and streamlined, or made in some way static. 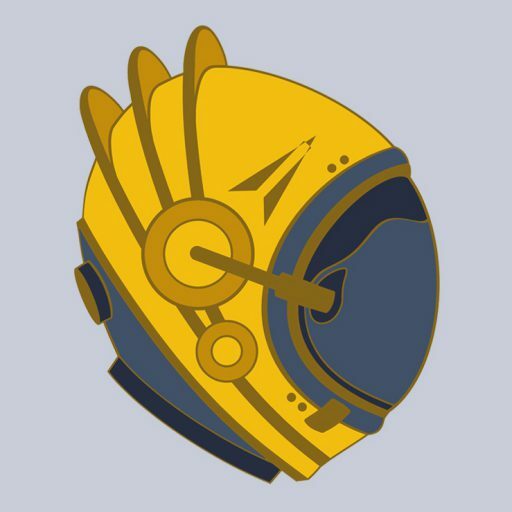 See: Padme’s live action costumes that were translated into animation, this post looking at Hondo’s look change, and the very early decision to move Ahsoka’s costume from the pleated skirt of Filoni’s initial sketches to the fitted skirt and leggings combo of the show (this is actually very similar to changes made to Wonder Woman’s very early costume: pleated skirt to star-spangled hot pants, as drawing the pleated skirt in action took vast amounts of time. I plan to discuss this in the future.) However, these decisions must always be grounded in character, design decisions need to be internally logical, whether historically or aesthetically. 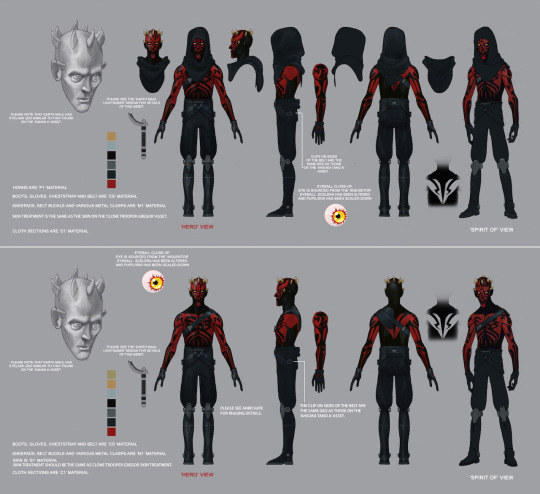 In Maul, he was stripped back and back before being slowly rebuilt appearance by appearance. Allegedly at one point these ‘spider’ legs would have been assembled of bones from the corpses and carcasses strewn about his cave, but this was walked back and the impression of a spine and wasting skeleton was left to match his shredded psyche. This is a man abandoned and lost, literally sent down a trash chute and abandoned. He has no purpose – all of his training has been replaced with insanity, leaving him to focus only on blind vengeance in the abstract. A short trip home to Mother Talzin, and he is something more understandable, more familiar, but still other, still brutal; ‘We wanted to witch him up a bit,’ Filoni says on the season 5 video commentary. Maul is bipedal once again, but his legs are far from humanoid with their backwards knees, claws and aggressively flexible joints. Otherwise, he is bared but armoured: a collar, graeves. But when he speaks, he is cultured and clever, full of machinations as he plots with his new apprentice to regain power. He’s at odds: an apprentice who is now a master, a weapon of force and fury with a sharper mind, bare tattooed flesh next to metal and machine, elegant and etched graves despite how unformed the rest of him is. 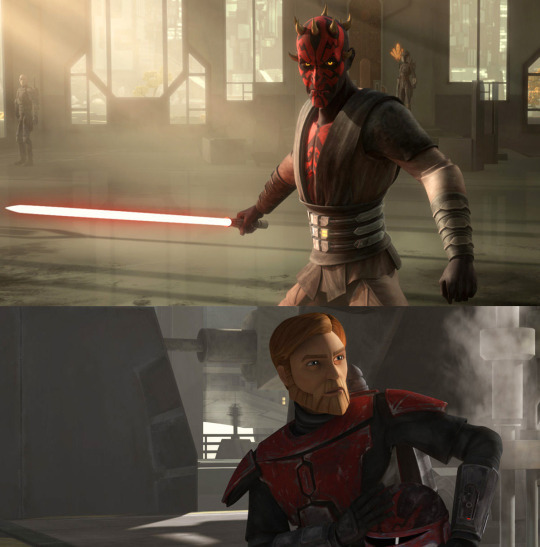 When Kenobi and Maul finally come face to face after so many years they strike an immediate contrast. The softness of the light-coloured Jedi robes against Maul’s feral industriality. Maul is surrounded by fire and death as Obi-Wan stands in the light, in the air, even going so far as to help a malfuncitoning droid, to find some levity. There are echoes of their last meeting on Naboo, when Maul rained sparks on a desperate padawan, and future echoes of an inversed Mustafar (Kenobi does not have the high ground here.) 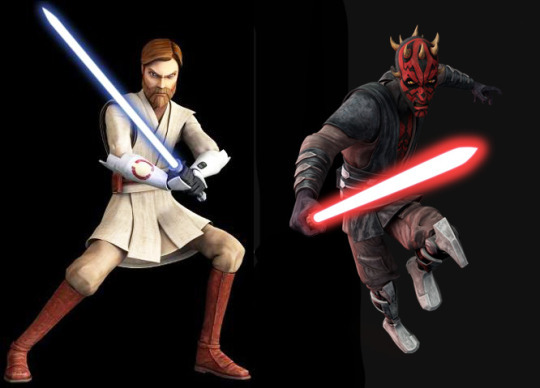 At this point in the Clone Wars, Kenobi has started to strip back himself even as Maul is rebuilding himself. Like Maul his only armour is his graeves, having eschewed his armour for his robes. The two of them are drawing together i visual middle-ground as they encroach on each others life again. 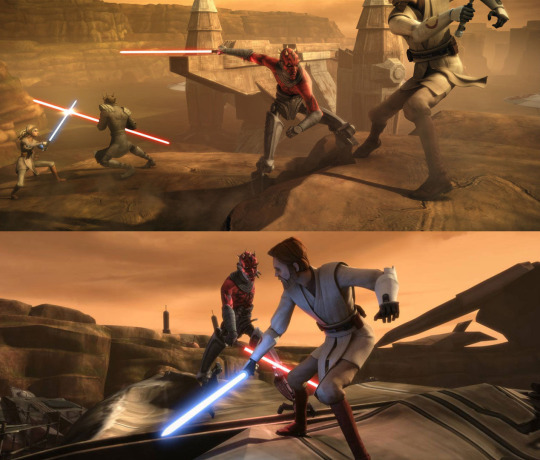 Even in combat, Maul and Obi-Wan find themselves mirroring each other. Once Maul is rescued post-Revival and allies himself with Death Watch, he is finally something approaching to whole. His new legs are essentially humanoid, he is wearing something assembling an outfit. Maul is a man with a mission, a purpose and an ensemble. He’s a weapon but of an entirely different nature to when we first met him in TPM as he finally sets up his pieces to place himself back in power, back in the war, and have his revenge against the galaxy and, as always, Kenobi. It is here that this oppositional force between Maul and Kenobi becomes really interesting, right as it begins to self-destruct. Maul’s Mandalore ensemble has trousers, under and over tunic (that he still hasn’t quite gotten the hang of) graeves and slightly more refined variation of his giant mechanical belt, now layered over an obi. We’re see those lines of his former self clearly returned, but still pared back.His silhouette is, basically, traditional, a dark reflection of the Jedi robes. More fitted than the TPM look, but still more open than the Jedi robes, particularly Kenobi’s robes which have grown more fitted and less open (particularly in the neckline which has risen with each film and season.) The two have become inverted, yet parallel, Kenobi now coming from a place of strength and security unlike in their first confrontation on Naboo, whereas Maul – despite his confidence in his fledgling underworld empire – does not have that security, that strength or confidence. He isn’t what he’s meant to be. He is a Sith Lord, but he has little ground to stand on. 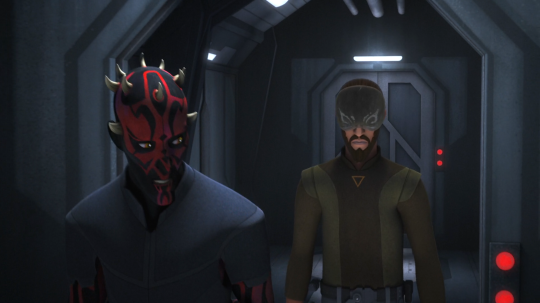 Rather than the deep, light-sucking black of before, Maul now has shades: his trousers and undertunic are brown, which sits almost uncomfortably against the industrial metal of his armour, his legs, his belt. Against the starkness of his tatooed skin and his rage. That;s the brown of a Jedi, and even more so it is the same brown and same layers that Kenobi wears; at this point, Kenobi is wearing the brown undertunic, and by Revenge of the Sith he matches this with brown trousers. The manifestation of their shared obsession. After Maul’s disaster on Mandalore, he was imprisoned on Stygion Prime in Son of Dathomir. There isn’t much to say about this within this context – he was stripped to his trousers, and then straight back into his Mandalore duds for the rest of the book. He was atttempting to resume his aborted plans. The details of what happened to Maul after the Siege of Mandalore are unknown (and essentially during, beyond the broadest strokes – I have not managed to get my hands on Ahsoka yet.) When we finally catch up to him in Twiligiht of the Apprentice, we know that he has spent years alone in the dark on Malachor. He has lost everything – all power, all allies, and seemingly all sanity. He is a Shadow. Once again he is stripped back: trousers, some sort of bandolier, a hood. He has no driving desperate purpose – as far as he is concerned he does not have a nemesis or any chance of ever achieving his one tenuous goal of getting the Sith holocron. Then along comes Ezra. Along comes Kanan. Bit by bit – as he did through the Clone Wars – Maul comes back into focus, standing upright and throwing off his shadowy shroud. He has a goal, a focal point: an apprentice, an enemy, a goal. In season 3′s Holocrons of Fate, Maul has once again found himself an ensemble, and it becomes clear that Kanan Jarrus has stepped into the role of his nemesis. After all, Kanan has the apprentice and the information that Maul wants. Quite possibly the life. His silhouette now echoes Kanan’s in its notched high neck, the streamlined shape, their short gloves. The cut of his shoulders mimcs the epaulettes of Kanan’s jumper. As with the mirroring of Kenobi, it is incomplete and inversed: short-sleeved and ragged. He is not whole, but he is stepping towards something bigger. He is no longer Darth, only Maul, and is unsure of exactly what he is beyond anger, hate, and an enemy to define himself by.